You can connect as many private databases to your Mode organization as you like. 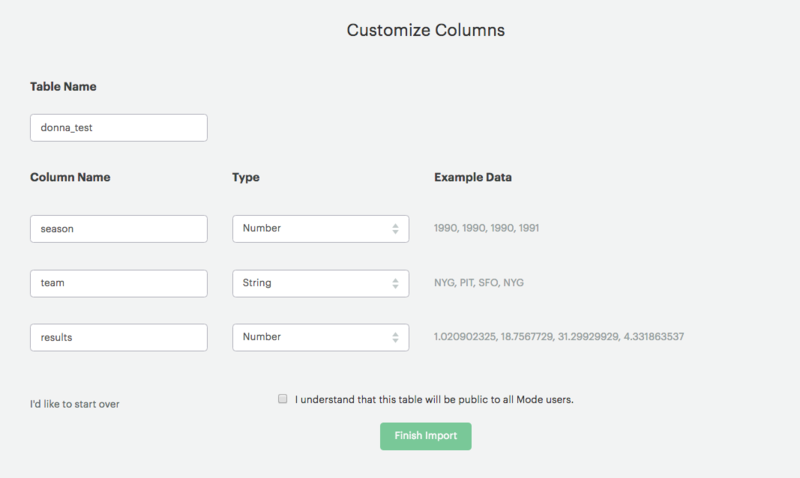 Mode supports connecting to most popular types of relational databases. When you connect a database to your Mode organization, by default all members of your organization will be able to run queries against that data connection. All organizations are also automatically connected to the Mode Public Warehouse. Navigate to your Mode homepage and sign in. Click on your name in the upper left corner of the screen. Follow the instructions to connect your database. Learn more about how Mode connects to private databases. IMPORTANT: Any active member of a Mode organization can create a new database connection. By default, new database connections may be queried by all members of the organization. To restrict non-admin access to a data source, you can limit access to it to specific users. You delete or modify the settings and credentials for a database connection only if you’re an admin or if you were the member who connected it to the organization. Navigate to the Mode home page and sign in. In the Data section, click Connections. All the database connections for your organization will be listed on the right. Click on the connection and then click Settings to adjust the database credentials and configuration. Click Delete to disconnect this database from Mode. IMPORTANT: Deleting a database connection from Mode will prevent all reports built using that connection from running until a new connection is selected. Deleting a database connection will not, however, have any effect on the database itself. Most databases provide robust permission systems, which let you manage user roles to set detailed schema- and table-level permissions. In Mode, your organization will access each data connection through a single user, which we recommend you or your database admin create expressly for use with Mode. Members of your organization who use this data connection will be able to execute queries according to the permissions granted to this user in your database. You can connect Mode to the same database multiple times via different database users, with different levels of permissions. There are various ways you can control the data that members of your organization can query in Mode. One way is to leverage the permissions granted to the single user your organization relies upon to connect to a given database. Limiting that user’s permissions on the database side will in turn limit the access of all members of your Mode organization for that data connection. Query the database or create, clone, or edit any reports that query that database. Write or view any of that data connection’s Definitions. IMPORTANT: Admins in a Mode organization always have query access to all data connections in that organization. Click on the data connection you want to limit. In the pop-up box, click Add next to each user or user group that you want to grant access to this connection. If you change your mind and want to remove that member, hover over Added and click Remove. Click Finished when you’re done. 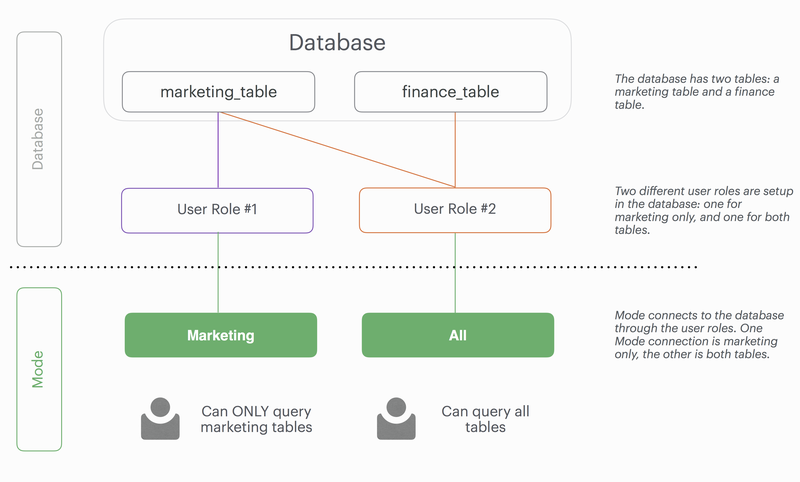 Here’s an example of how this setup might look for a company with a single database, connected to Mode via two different database user roles. Note that these permissions only determine query access. Users in your organization will be able to see a report created with one of these data connections unless the report is in a private Space. In this simplified example, the company’s database contains two tables: a marketing table and a finance table containing sensitive information. User Role #1 only has access to the marketing table. User Role #2 has access to both the marketing table and the finance table. When you connect a database to Mode, you do so using database user roles. Each connection will appear as a different database in the schema browser. Note that the default name will be the name of the database (e.g. Redshift), but you can also name it based on a description of the access level or user role. Mode Business organizations can also specify which Mode users have access to each connection. A user with query access to “Marketing” will ONLY be able to query the marketing table. They will not have access to any sensitive financial information. A user with query access to “All” will be able to query the marketing and finance tables. Manage database load by giving services downstream of Mode context about who is running the query or why it is being run. Automatically set environment variables, such as default schemas and time zones. Add custom logging to each query that will appear in your database’s logs. You must be the creator of a data connection or an organization admin to modify its query header. Click on the data connection you would like to modify. In the space provided, add or modify any valid SQL code (including comments and valid Liquid code) that you want Mode to prepend to all queries run against this connection. *Find a group’s token by going to Settings > Groups > click a group. The token is a 12 character string at the end of the URL. Learn SQL by completing Mode’s SQL school. Share analysis with or learn from anyone in the Mode community. Experiment with all of Mode’s features. Anyone with a Mode account has access to the Mode Public Warehouse and can build reports on top of the data inside it. IMPORTANT: All data uploaded into the Mode Public Warehouse is publicly accessible by anyone on the internet, so take care not to upload anything sensitive or confidential! Sign in to Mode. If you don’t have an account yet, create a free Mode user account here. Locate your name in the upper left corner of the window and ensure it says Mode Community above your name. (If not, click on your name, click Switch, scroll to the bottom of the pop-up and click the Switch button under Mode Community). Click on your name in the upper left corner of the window and then click Contribute Public Data. Select a CSV (up to 500 MB) containing the data you’d like to upload. Next, you’ll set the column names and types. Columns follow the same naming rules as tables. If you are unsure about the data type for any particular column or would like a general overview of data types, check out the SQL School lesson on data types. When you are finished, check the box next to “I understand this table will be public to all Mode users.” and then click Finish Import at the bottom of the Customize Columns screen. You can now query this data in Mode by selecting Mode Public Warehouse as the database. Click on your name in the upper left, and click My Account. Click on the Public Table table-large-bg Created with Sketch. icon. Click on the name of the table you want to delete. Click the gear settings-mini-hover Created with Sketch. icon next to the green Query button and choose Delete table.